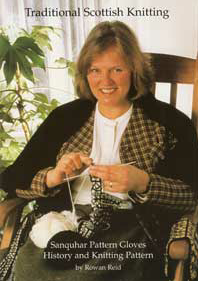 The gloves are knitted in the Sanquhar Patterns, traditional patterns found in the Royal Burgh of Sanquhar in Dumfriesshire, South West Scotland. Collecting from a sock knitter in Harris. Pictures from the Vanishing Scotland Traditional Knitting Workshop on a beautiful Saturday in Autumn in the tiny clachan of Tynron.